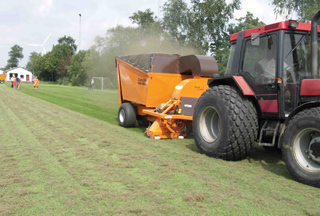 Vertiflex is the latest product in the line of machines based on the popular Combi-Trailer. VertiFlex is developed for leaf vacuuming, scarifying and grass vacuuming/ sweeping. The three individual working units enable the VertiFlex to operate effectively even in hilly surroundings. VertiFlex is equiped with a spring system which secures that left material between the knives is collected. This ensures an optimised collection of the material. The cutting depth is set stepless so you have the setting you want.